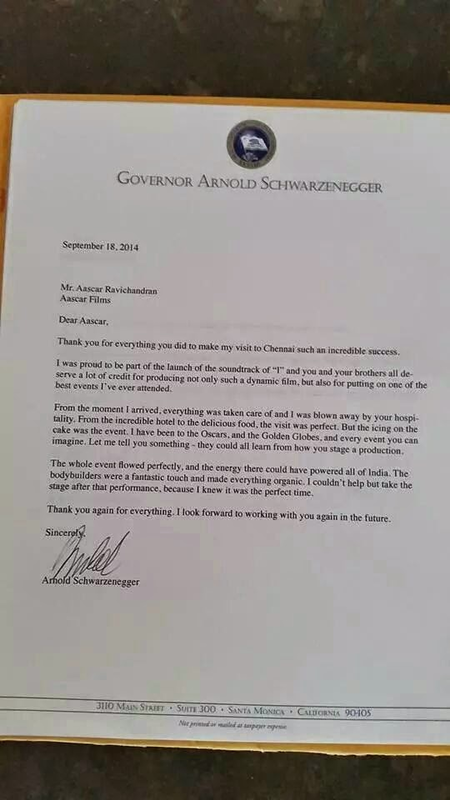 Arnold has released an official statement that says that, the audio launch for I was one of the best events he has attended. He even compared this with Oscars and Grammy award functions, that are done with a world class technology. The official statement is shown below. Please comment your thoughts. The post reads like this. Thank you for ever thing you did to make my visit to Chennai much an incredible success. I was proud to he pan of the launch of the soundtrack of "I" and you and your brother‘ all deserve n lot of credit for producing not only such a dynamic ﬁlm. but also for putting on one of the best events I ‘we ever attended. stage after that performance. because I knew it was the perfect time. Thank you again for everything. I look forward to working with you again in the future.